Tidbit Tuesday: Update Those Apps! Today I want to talk with you about updating your apps. 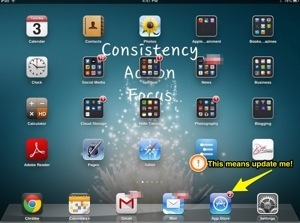 That little number that you see beside the apps icon on your iPhone or iPad means that there are updates. It only takes a few seconds to update your apps. Don’t wait until it gets to needing 24 or more apps that need to be updated. Because that will take longer and you will need to be on wifi as not to drain down your data allowance with your cell company. When you have updates to your apps it is usually important and helps the app to run better. If you find that your favorite app keeps shutting down then a update may be the reason why it is not functioning correctly. So go update those apps! And keep them updated. This is one habit that will help you in the long run. It doesn’t take a ton of time if you do them when you see the little update icon. You should also regularly update your computer too. If it says update then update it!